Yesterday I came home to find an awesome surprise in the mailbox - the spring 2013 issue of Kayak Angler Magazine (KAM). KAM is probably the most widely published and reputable kayak fishing magazine on the market today and has been one of my favorites since I first picked up a paddle. Last year as I was planning the BASS Slam, I thought that our adventure and attempt at the challenge would make a cool article. Of coure, I knew I was biased, but after we returned from our road trip I was even more enthused about the idea. So I dropped an email to Scott MacGregor, the founder and publisher of Rapid Media - which publishes KAM. A few weeks passed before Scott got back to me, but he liked the idea and forwarded it to Ric Burnley. Ric is the current head editor for KAM and he too really liked the idea. We decided to pitch it as a "feature article", but it was just that - a pitch. It still had to be voted on and have publishing details worked out if it was approved. 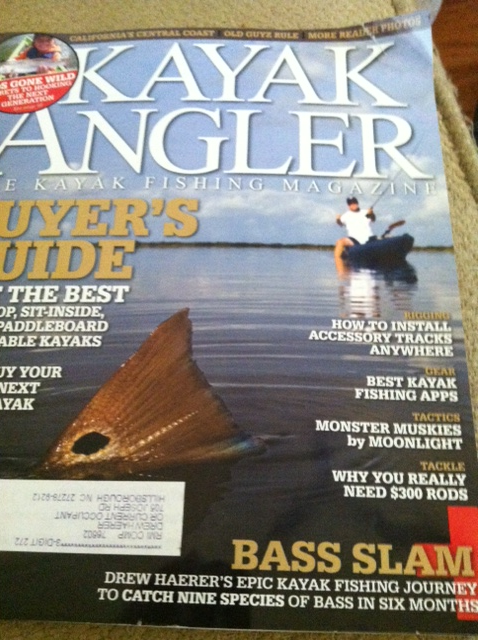 The Spring 2013 Issue of Kayak Angler Magazine - sweet cover art! After a few months of nervous waiting, good news arrived - we were in! I was stoked. The trip was such a cool experience that I couldn't wait to share it with folks. I started working on the article, getting our favorite photos rounded up and going through hours upon hours of video. After a month or so the article was starting to take shape. Ric had given me an original deadline and we were on pace to meet it - no problem. Then, on Thanksgiving morning, I got an email and call from Ric. His other articles and deadlines were a mess and he needed something ASAP to give to the publishers. So over the course of Thanksgiving day, he and I traded emails, edits and phone calls and knocked out a nearly complete article. Coincidentally, Mary May had to work most of the day, so that gave me the time to balance editing and not burning the turkey. By the time she came home, I had somehow managed to fill the house with all sorts of Thanksgiving goodness and get the publishers off of Ric's back. The format continually evolved into the final form. It was super fun to see it keep getting better and better along the way. 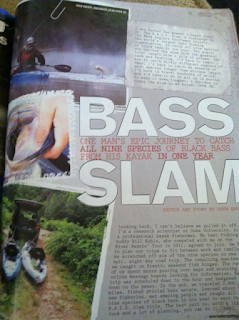 I also put together a BASS Slam overview video for Kayak Angler Online. When I finally got to open the issue and see all of my hard work, it was totally worth it. Beyond my contribution to the magazine (pages 53-56), there are a ton of great photos and articles worth a look including some cool artwork from Rob Choi and inspiring stuff from Heroes on the Water. Because of the strict word count, there was A LOT that got left out. I am hoping to share some of those side stories here on Man Powered Fishing in the next couple of weeks, so keep an eye out. There were also a few things that got "lost in translation" where a key word or two got yanked to cut down on the word count that made a big difference - especially when it came to locations. One particular word that got yanked multiple times was "basin" and another was "amazing", which was originally placed before the word "girlfriend". If you have questions about the article or the slam, feel free to email me (drew@manpoweredfishing.com). Also, I hadn't originally included a lot of specifics about baits, particularly brands, in order to cut down on my word count. But they were later added and you will notice that we caught a lot of fish on four specific baits - a Yamamoto Senko, Deep Creek Lures MT and Sink 'N Catch Worms, SOB Lures Buzzbaits and the Premier League Lures River Special spinnerbait. Honestly, you could easily catch the slam with those baits alone. They are all top of the line. Along those lines, another big thanks to friends, family, and kayak fishing peers who helped along the way. And of course, the companies I partner with because they make awesome gear - Malibu Kayaks, Crack of Dawn Paddlesports, Carolina Custom Rods and Columbia Sportswear. And I shouldn't leave out YakAttack, Kayalu or Kokatat whose gear also travels with me. One last thing - if you are interested in doing a BASS Slam trip, Froggy Waters Guide Service is going to start offering an all inclusive "Slam Package" starting this spring, which will be guided by yours truly. It will include all travel, lodging, licenses, gear, shuttles, float plans and guiding for the entire trip. 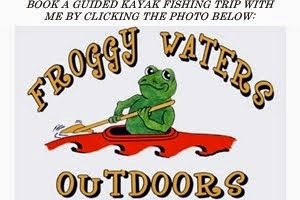 Check out Froggy Waters Outdoors for details. Happy reading and tight lines! awesome job,I haven't visited in a while but good going drew. freaking cool man. Thanks - for the kind words and for stopping by to read! Nice stuff Drew, I can't wait until mine gets in the mail.